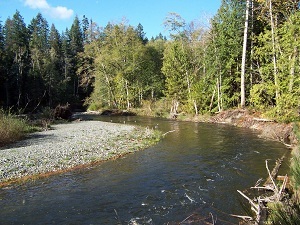 Acquired by the RDN in 1999, the park runs along both sides of the Little Qualicum River immediately downstream from Little Qualicum Falls Provincial Park. The regional park is largely undeveloped with rough trails that lead to the river. A developed trail off Meadowood Way provides an easy link between the regional park and Little Qualicum Falls Provincial Park. 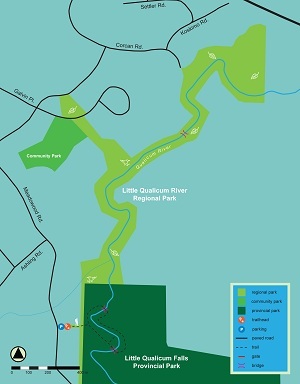 The original park size was 44 hectares and with the addition of 68 hectares in the spring of 2017, Little Qualicum River Regional Park has grown to 112 hectares. The additional lands were transferred to the RDN as a donation by Wicklow West Holdings, Ltd.
A public management planning process was undertaken in 2012. The completed plan will guide the operations, development and stewardship of the property over a 10-year horizon from 2013 to 2023. 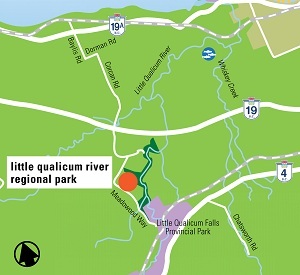 Click here to access the Little Qualicum River Regional Park Management Plan 2013-2023. The park can be accessed from Highway 19A; to Baylis Road, to Dorman Road, then onto Meadowood Way. The Meadowood Way trailhead has a parking lot for 5-8 cars. A short section of forest trail leads into the park and adjacent to Little Qualicum Falls Provincial Park.